William “Bill” Raymond Buck, a longtime resident of the Metro Detroit area, passed away on October 25, 2018 one week before his 82nd Birthday, in the loving care of his family after battling Multiple Myeloma. Bill enjoyed boating, hunting, fishing, was always quick with a joke and a laugh, and had a genuine way of making all he met feel loved. 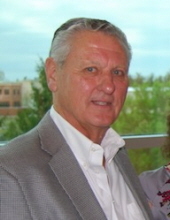 In addition to Janice, his beloved wife of 25 years, Bill is survived by their children, William (Christine Marshall) Buck, Jr., Michael (Julie) Buck, Joseph Buck, Allison (Eric) Buck Schulte, Nathan (Holly) Strong and Anne (Bill) Strong Wangard; 13 grandchildren, and 3 great-grandchildren; brother, James (Sandra) Buck, a loving extended family and many dear friends. Bill was preceded in death by his sister, Shirley (Dennis) Seger. Memorial Gathering will take place at Lynch & Sons Funeral Home, 404 E. Liberty St., Milford on Thursday, November 1, 2018 from 4-8 PM. Rosary 7 PM. Mass of the Resurrection will be held at St. Mary Our Lady of the Snows Catholic Church, 1955 E. Commerce St., Milford on Friday, November 2, 2018 at 11 AM with gathering half an hour prior beginning at 10:30 AM. The Rev. Msgr. John Budde to officiate. In lieu of flowers, memorial donations may be made in his name to Kindred Hospice Foundation 25925 Telegraph Rd., Suite 102, Southfield, MI 48033 and The Michigan WWII Legacy Memorial P.O. Box 237 Royal Oak, MI 48068. For further information, please phone Lynch & Sons, Milford 248-684-6645. "Email Address" would like to share the life celebration of William Raymond Buck. Click on the "link" to go to share a favorite memory or leave a condolence message for the family.